*This article originally appeared on MyNorth.com on Sept. 15, 2014. 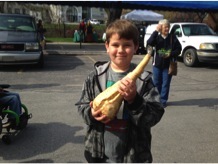 Just before school let out last year, Traverse City third-grader Tyrell Stott walked through the downtown farmers market with his mom Judith Ann Stott and spied a root vegetable nearly as big as his torso. The school, in this case, was Traverse Heights Elementary. It’s one of four in the Traverse City Area Public Schools system and 14 region-wide in eight districts that have been participating with the Michigan Land Use Institute’s farm to school education program. That program includes an AmeriCorps program called FoodCorps plus community educators paid with a National Farm to School Grant. The Traverse Bay Area Intermediate School District is working with MLUI and FoodCorps to develop lessons that align with teaching requirements for long-term sustainability. Need to teach fractions? How about cutting an apple into equal parts and then taste-testing different varieties grown by local farmers? At Platte River Elementary in the Benzie County Central school system, one student first cast his vote for “liked it” when he tasted kale chips. Then, he came back to try it again and re-cast his vote. He said: “If I double-try it, I love it!” It’s these types of multiple exposures to healthy local food that will make a difference for students, and for school food service efforts to serve it. The other schools participating in the program are Central Grade, Blair and Interlochen in the TCAPS system; Betsie Valley, Crystal Lake and Lake Ann in the Benzie Central system; and the Frankfort, Northport, Glen Lake, Leland, Suttons Bay and Central Lake elementary schools. Apples, apricots, asparagus, beets, blackberries, blueberries, cabbage, carrots, cherries, dry beans, grapes, kale, lettuce, nectarines, onions, parsnips, pears, peas, peppers, plums, potatoes, radishes, raspberries, strawberries, spinach, swiss chard, tomatoes, Romanesco cauliflower, and winter squash. Each of the eight districts participating in the program also are part of another initiative called 10 Cents a Meal for School Kids & Farms. This project recognizes that schools have tight food budgets, with only 20 to 30 cents a meal to spend on fruits and vegetables. 10 Cents a Mealprovides a maximum match of 10 cents a meal for locally grown fruits and vegetables when schools spend at least 20 cents a meal on local produce. It’s based on one of the recommendations of the Michigan Good Food Charter. If you like the idea of farm to school in the classroom, cafeteria and garden you can learn more and discuss ways to make these innovative programs sustainable for the long-term. It’s one of the topics at an upcoming event October 10 in Traverse City called Food, Farms & Health. Learn more here. Keep up on other fun activities at the Farm to School in Northwest Michigan Facebook page. And if you have a great farm to school story, send it to Diane Conners, Senior Policy Specialist at the Michigan Land Use Institute at diane@mlui.org.